Often homes that are rustic in nature are much smaller than the modern-day version. Yet the rustic home demands a warm ambience, which means having a fireplace. But, there is the safety factor that comes with this. For this reason, the gas fire is a perfect choice. It is safe to use in smaller spaces. One of the exciting features of the gas fireplace is the many styles it comes in. 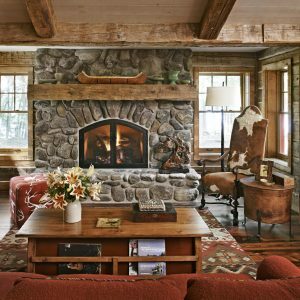 Some rustic homes already have a woodburning fireplace built in. The owners do not want to use this for a lot of reasons. Or, it may no longer be usable. In many cases, it can be easily converted to a gas fireplace. For those that are buying a whole new unit then they want a style that is going to fit in with their rustic decor. Even the choice of the fire logs and their shapes are going to be important in creating the look. The mantel options are many. They come in all shapes and sizes. Or they can opt for the gas stove style. The first thing is to determine where the gas fire is going to be used, according to the rooms. Many people like to have at least one in the living room. Then perhaps another in the bedroom, or even the kitchen. The choice here is to choose two of the exact same style. Or, to choose two totally different ones but staying within the rustic look. The rustic look is different from the antique look. Thought has to be given as to whether the fireplace is going to be used as a heat source. This will help to determine the size that is needed. If it is going to be used in a small room then a smaller version will be more appropriate.